Philip Moore (b1943) was awarded the degree of BMus from the University of Durham before becoming an Assistant Music Master at Eton College in 1966. In 1968 he moved to Canterbury Cathedral as Assistant to Allan Wicks, a post he held until 1974 when he became Organist and Master of the Choristers at Guildford Cathedral. In 1983 he succeeded Dr Francis Jackson as Organist and Master of the Music at York Minster. Moore has a strong interest in composition and his output includes instrumental music, music for chorus and orchestra, as well as choral and organ works. His largest work is the Organ Concerto (1993). Finding suitable words to set can be a surprisingly time-consuming part of the process of composition. The authorities at St Paul’s made life easier for me by submitting a variety of helpful and appropriate suggestions. Of the texts offered, the hymn Lo! God is here! immediately struck me as being eminently suitable for the occasion at which the anthem was to be sung. Further research produced an extra verse not normally included in the hymn books. Once the process of composing began in earnest, thoughts of the unique sounds of the St Paul’s choir and organ were clear in my mind. I decided not to be too constricted by the abundant resonance, but rather to make use of the warm richness of eighteen men and the bright intensity of thirty boys, as well as the kaleidoscope of colours available on the organ. It was at this stage that the idea of including a plainsong psalm came into my mind. I have always found plainsong curiously compelling, and, even more so, accompanied plainsong. For a service commemorating the dedication of a church or cathedral few texts are more appropriate than Psalm 84, whose verses are below printed in italics. The altos, tenors and basses in unison sing the opening theme of the work. The melody and the accom­panying chords are the germ ideas for the whole work. A treble soloist sings the plainsong. The way in which it introduces an element of stillness and tranquillity is intentional and contrasts with a sense of awe engendered by the first verse of the hymn. The meaning of some of the words has now changed: ‘dreadful’ in this context means ‘full of awe’—awe-full. The material for the fast and vigorous middle section is based on the opening ideas. For much of the time the organ and choir are in dialogue with each other and the music builds inexorably towards the line ‘Disdain not, Lord, our meaner song, Who praise Thee with a stammering tongue’. The climax comes on the word ‘praise’, after which the music subsides (the word ‘stammering’ here means ‘faltering’) and leads to a return of the opening material for the last verse of the hymn, interspersed with further verses of the psalm. 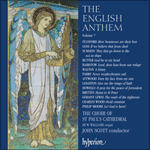 In this final section the roles of the choir and soloist are reversed, with the plainsong sung by the full choir in unison and the words of the hymn sung by the treble soloist. After a brief excursion into eight-part imitative writing the work closes with a repetition of the first line of Psalm 84. O how amiable are thy dwellings: Thou Lord of hosts! And own how dreadful is this place! And silent bow before his face. Blessed are they that dwell in thy house: they will be always praising thee. Serve him with awe his rev’rence love. Who praise thee with a stammering tongue. Thy courts with grateful fragrance fill. Still hear and do thy sovereign will. Behold, O God our defender: and look upon the face of thine Anointed.